Most dental issues are progressive, and without prompt treatment, what starts as a small nuisance can blossom into a severe oral health complication. Tooth decay, for example, begins when oral bacteria form plaque and attack your tooth enamel. If left untreated, oral bacteria will infect the tooth’s main structure and can reach the nerves and blood vessels inside of the tooth’s pulp. In severe cases of tooth decay, a filling might not be enough and your dentist will have to perform root canal therapy (or endodontic treatment) to remove the infection. In many cases, root canal therapy is the only way to stop the spread of decay from the pulp and through the root canal connected to it. 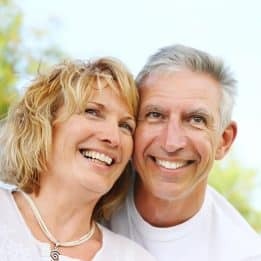 The long-term benefit of root canal therapy is the preservation of your natural tooth, but immediately after the procedure, you may be most thankful for the absence of tooth pain. Internal infection causes severe discomfort in the tooth, which can only be relieved by removing the infected nerves and soft tissues. Like placing a tooth filling, root canal treatment requires removing oral bacteria and infected tooth structure from the tooth. To access the tooth’s pulp and root canal, your dentist will anesthetize the tooth, and then create a small hole in the tooth’s crown. Next, your dentist will carefully remove the infected tissues, then clean, sanitize, and fill the root canal and pulp to strengthen and protect them. Finally, your dentist will place a lifelike dental crown over the tooth to completely restore its strength and protect it from the pressures of biting and chewing. Following root canal treatment, some patients may continue to experience pain and complications if the treatment fails. This can occur shortly after or years following the procedure, depending on the specific reason for the failure. In such cases, we may be able to perform root canal retreatment to stop the returned infection from growing worse. If performed in time, root canal retreatment can help you avoid having to extract and replace the tooth. 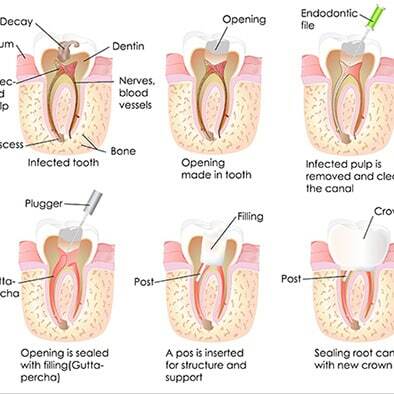 In some complex cases, removing a severe tooth infection may require root canal surgery, the most common of which is apicoectomy (or root-end resection). The surgery involves making a small incision in the gums over the tooth root and carefully exposing it. The infected root tip and surruonding inflamed tissues are removed, then your dentist can restore the remaining tooth root structure with a small filling. After suturing the incision closed, the tissues and bone structure will heal around the treated root. When a tooth is exposed to an excessive amount of pressure or is subject to sudden, severe trauma, its main structure can crack severely enough to expose the tooth’s sensitive pulp and root canal. Any further irritation, such as pressure and friction from biting and chewing, can cause the fracture to worsen. To prevent the inner structures from becoming infected, your dentist might recommend performing root canal treatment before capping the cracked tooth with a custom-designed dental crown. Some traumatic tooth injuries may not fracture a tooth, but can still cause serious damage such as knocking the tooth loose or completely out of its socket. Many patients with a knocked-out tooth can have the tooth replanted and then stabilized, often with root canal treatment, shortly thereafter. If your tooth has been knocked out, then be sure to store in a small container of milk and bring it with you to your emergency dental appointment. If you experience severe tooth pain, then let your dentist determine if your tooth is internally infected and requires root canal therapy. To learn more, schedule a consultation with one of our experts by calling the My Dentist office in Londonderry, NH, today at (603) 965-3407.